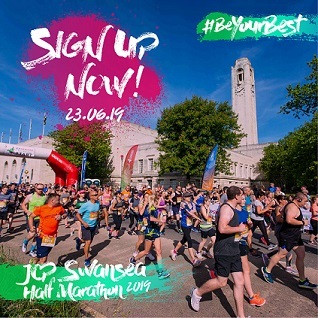 The JCP Swansea Half Marathon starts in front of the iconic Brangwyn Hall, before heading through the City Centre onto Oystermouth Road. From the closed roads you’ll spot the floodlights of St Helen’s Rugby ground. The famous old ground harbouring such famous memories of Sir Garfield Sobers hitting six sixes off a single over in a first class match in 1968 and where Swansea RFC beat Australia in 1992. 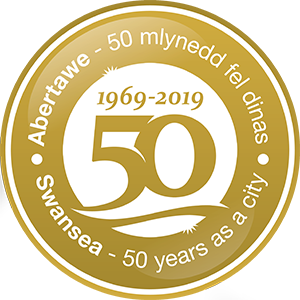 You will then enjoy the stunning views of Swansea Bay as you head towards the village of Mumbles and it’s iconic pier and lighthouse – this pretty setting which leads to the Gower Peninsular is a haunt of Catherine Zeta-Jones and was of poet Dylan Thomas. You will turn and head back towards Swansea via the flat, purpose-built cycle/walkway alongside mile of sandy beaches. On a clear day you can see as far as Illfracombe on the Devon Coast. The return leg of the race heading towards the Meridian Tower – Wales’ tallest building provides a perfect opportunity for a PB with a flat, fast promenade guiding you towards Swansea Marina where you will run over the lock bridge in to the city’s newly developed SA1 area before you cross the Millennium Bridge spanning the River Tawe and head back towards the finish near to Museum Green.